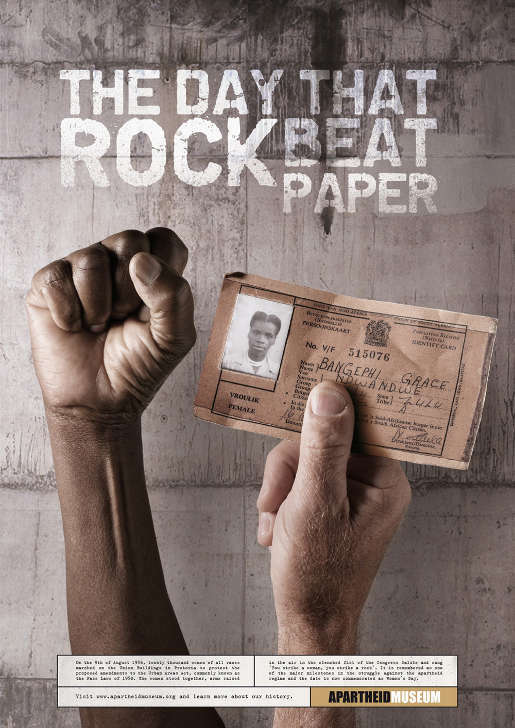 Apartheid Museum in South Africa commissioned a print advertising campaign to mark National Women’s Day, a public holiday commemorating the 9th of August 1956 when 20,000 South African women of all races marched on the Union Buildings in Pretoria. The protest was designed to express opposition to the Urban Areas Act, commonly known as the Pass Laws, legislation that required ‘non-whites’ to carry a document known as the Dom Pas which would allow them to move around, or live in ‘White South Africa’. The Women’s Day advertisement was developed at TBWA\Hunt Lascaris, Johannesburg, by executive creative director Damon Stapleton, creative director/art director Justin Wright, creative director Vanessa Gibson, copywriter David Edworthy, photographer Clive Stewart and retoucher Tebogo Suping.